Houston, TX-- Teens Exercising Extraordinary Success (T.E.E.S. 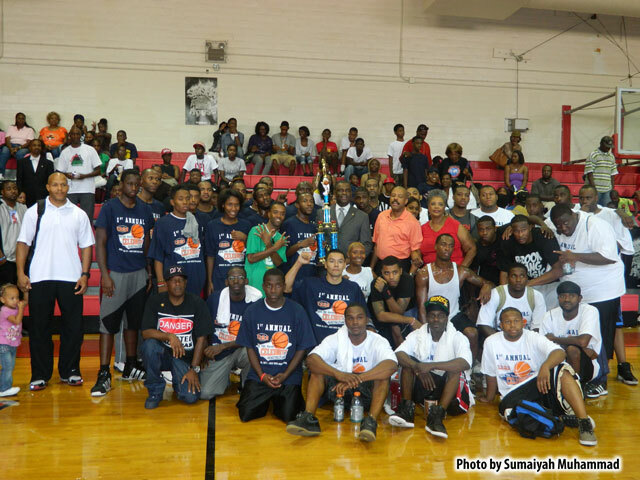 ), a local youth empowerment organization, teamed up with Jack Yates High School and hosted the 1st Annual Back 2 School Save The Youth Celebrity Basketball Game on Saturday, August 20, 2011. The goal of this event was to inspire and motivate youth to make positive decisions. “We are so very pleased that the community came out to support this first event. We hope that the event inspired many of the attendees and participants. We hope that they take and learn from this experience. We look forward to many more events of this kind for the youth”, said T.E.E.S. Founders. The event was a sold out affair and attended by a host of special guests including Houston City Council member Wanda Adams, HISD Board President Paula Harris, Texas State Representative Borris Miles (who also was the Head Coach of the Celebrity Team), Student Minister Robert Muhammad, Reverend Dr. Robert Gilmore (’76 Yates graduate), and more. The celebrity team consisted of rappers DJ Chose, Brook Gang Music, Propain, Yung Red (SwishaHouse), Magno (SwishaHouse), KB (Christian rap artist), and the legendary DJ OG Ron C, co-founder of Swisha House. SwishaHouse Vice President, G-Dash, was on hand lending support to the artist. The Celebrity Team went head-to-head for four quarters against the F.O.I. of Muhammad Mosque No. 45. It was a battle to the end and onlookers in the crowds never left their seat. There was not a dull moment at this event. During half time the Jack Yates Drill Team and National Champion Jr. MGT Drill Team of Mosque #45 treated the crowd to a breath taking performance. The final score was 76-60, with the F.O.I. taking the trophy. Throughout the game, there were Black history Q&A’s for the audience and those who gave correct answers received free gifts. There were extraordinary door prizes, give-aways, and auction items. Every attendee left the event with something in hand. All attendees received museum passes donated by the Houston Children’s’ Museum (each ticket admits 4 persons). There were door prizes from Studio Movie Grill, a weekend hotel stay in the Atlanta Marriott Buckhead, 2011 NBA All-Star gear, Atlantic Records promo items, scented gift packs (Simply Scents by Shan), Luke Records bandannas, posters from SwishaHouse, Nation 19, and so much more. Each player received top of the line drawstring back packs from 305 Films filled with great gift items from Amobi Okoye, Simply Scents, Luther Campbell, Houston Children Museum passes, among other things. There was a community resource center set up where guests were treated to face painting (Project Row House Teen Program), hands on computer activities and digital photographs (Michelle Barnes of the Community Arts Collective). Dr. Janice Beal, a child adolescent psychologist, had a wonderfully decorated table with information on behavioral health services and anger management programs. Dr. Akili Graham had information on How To Eat To Live workshops and proper health and nutrition. The Houston Texans YMCA, Houston Community College, St. James School, PABA, and Central Care Community Healthcare were also present with information on upcoming programs and other resources of benefit to children and families. This event showed that the community, youth, and rappers could come together and have a great time without violence. What a great kick off to the 2011-2012 Jack Yates School Year. For more information and photos please visit the website at www.teeskaty.com.